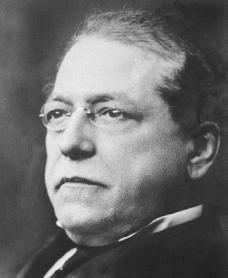 Samuel Gompers was born on January 27, 1850, in east London, England, to Solomon and Sarah Gompers. His family was Dutch-Jewish in origin and had lived in England for only a few years. The family was extremely poor, but at the age of six Gompers was sent to a free Jewish school, where he received the beginnings of an education practically unknown to poor people in his day. The education was brief, however, as Gompers began to work, first making shoes and then in his father's cigar-making trade. In 1863, when Gompers was thirteen, the family immigrated to the United States and settled in the slums of New York City. The family soon numbered eleven members, and Gompers again went to work as a cigar maker. Full of energy and naturally drawn to other people, Gompers joined many organizations in the immigrant world of New York. But from the start nothing was as important to him as the small Cigar-makers' Local Union No. 15, which he joined with his father in 1864. Gompers immediately rose to leadership of the group. At the age of sixteen he regularly represented his fellow workers when confronting their employers, and he discussed politics and economics with well-spoken workingmen many years older than himself. This was a time of technological change in cigar making (as it was in practically every branch of American industry). Machines were being introduced that replaced many highly skilled workers. The cigar makers were distinguished, however, by the intelligence with which they studied their problems. The nature of their work—the quietness of the process of making cigars, for example—permitted and even encouraged discussion of economic questions, and this environment provided Gompers with an excellent kind of schooling. The most important influence upon his life was Ferdinand Laurrel, a once prominent Scandinavian socialist (someone who think goods and services should be owned and controlled by the government), who taught Gompers that workingmen should avoid both politics and unrealistic dreaming in favor of winning immediate "bread and butter" gains in their wages, hours of work, and working conditions. In fact, Gompers had many contacts with socialists, though from his earliest days he had little time for their ideas. Basing his own thinking about unions on a "pure and simple" concrete approach, he built the Cigar-makers' International Union into a functioning organization despite modern technology and unsuccessful strikes (an event in which a group of workers stop working in an attempt to gain rights from their employer). In 1881, with several other union leaders, Gompers helped to set up a loose organization of unions that, in 1886, became the American Federation of Labor (AFL). Founded during the height of the Knights of Labor, the AFL was different from the older labor organization in nearly every way. Most importantly, the Knights wished for a society in which cooperation would govern the economy, whereas the AFL unions were interested only in improving the day-to-day material life of their members. The socialists' attempt to take control of the AFL in 1894 did succeed in removing Gompers from power for a year, but he was firmly back in control by 1895 and, if anything, more opposed to socialism in the unions than ever. "Socialism holds nothing but unhappiness for the human race," Gompers said in 1918. "Socialism has no place in the hearts of those who would secure the fight for freedom and preserve democracy." Throughout his career he argued against the thriving Socialist Party. Although there were many reasons that socialist thought did not take root in American unions, Gompers's influence as the head of the labor movement for forty years was important. Although the leader of a movement that lacked social respect, Gompers had good relations with several presidents and became something of an adviser to President Woodrow Wilson. In 1901 he was one of the founders of the National Civic Federation (an alliance of businessmen willing to put up with unions and moderate union leaders), and Wilson found it politically useful and worthwhile to have the support of the AFL during World War I (1914–1918; a war that involved many nations in Europe and that the United States entered in 1917). Gompers supported the war energetically, attempting to stop AFL strikes while the war was being fought and speaking out against socialists and pacifists (people opposed to war as a way of solving disagreements). He served as president of the International Commission on Labor Legislation at the Versailles Peace Conference and on various other committees. During the 1920s, though in failing health, Gompers served as a spokesman in Washington for the new Mexican government that had overthrown the old one, considering himself key in gaining American recognition of the new government. Mexican President Plutarco Elias Calles (1877–1945) received Gompers with high honors in 1924. Realizing that the end was near for him, however, Gompers returned early from the trip to Mexico and died in San Antonio, Texas, on December 13. True to his character, his last words were: "Nurse, this is the end. God bless our American institutions. May they grow better day by day." What had begun as useful for Gompers—acceptance of the capitalist system (in which goods and services are owned and controlled by private individuals) and working within it—had become his guiding principle. Indeed, he was one of the creators of the modern institutions that he referred to in his last words—for capitalism he won the loyalty of labor, and for labor he won a part in business decision making. Buhle, Paul. Taking Care of Business. New York: Monthly Review Press, 1999. Gompers, Samuel. Seventy Years of Life and Labor. 2 vols. New York: E. P. Dutton & Company, 1925. Reprint, Ithaca, NY: ILR Press, New York State School of Industrial and Labor Relations, Cornell University, 1984. Livesay, Harold C. Samuel Gompers and Organized Labor in America. Boston: Little, Brown, 1978. Stearn, Gerald Emanuel. Gompers. Englewood Cliffs, NJ: Prentice-Hall, 1971.
was the Magna Carta for labor. The Conservative Caucus of Delaware, Inc. I like his glasses; they make him look like Harry Potter.